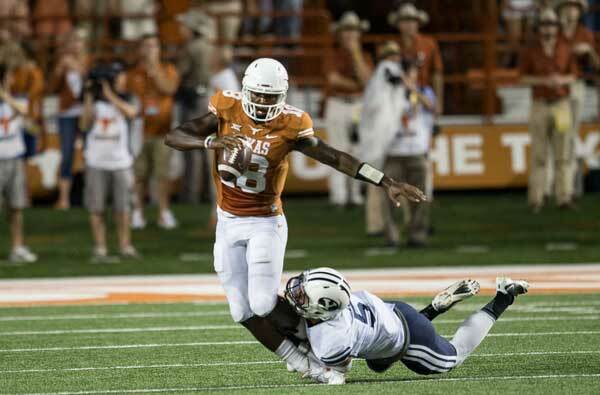 Texas Quarterback Tyrone Swoopes get tackled by a BYU defender (Photo: Don Bender). Coming into the 2014 season many perceived that the Texas defense would act as a strong suit of the team and that that side of the ball might have the ability to win games on its own, a notion that seemed fortified after the Longhorns’ dominating performance in their season-opening win against North Texas. In a stunning seven-minute stretch of the third quarter BYU scored 28 points on the way to a 41-7 dismantling of Texas before a stunned crowd of 93,463 fans. That offensive explosion by the Cougars jettisoned any ideas about the Horns’ defense faster than the rocket man who performs a 30-second flying stint over Darrell K Royal-Texas Memorial Stadium before each home game. With all the emphasis placed on making sure that BYU wouldn’t beat Texas the way it did in 2013 (when the Cougars swamped UT 40-21 in Provo), it’s impossible to believe that the Longhorns might have played even worse.